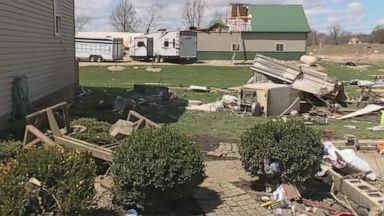 Thirty twisters tore through seven states, including a funnel that tore a 17-mile path through Shelby, Ohio, leaving six people injured. We're going to turn to the deadly weather in this country tonight. At least eight people killed, including three children. Lightning striking one world trade center here in New York City. Runners in the Boston marathon today forced to wait out dangerous storms there. An ef-3 tornado hitting Franklin, Texas tvx, winds of 140 miles an hour. 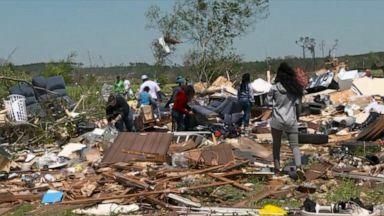 There have been at least 30 confirmed tornadoes from Texas to Ohio. The latest just today in Delaware. ABC's Marcus Moore tonight is in cherokee county, Texas, where two tornadoes struck one town. Reporter: Tonight, fresh destruction in the east from that severe weather outbreak. A tornado damaging a dozen buildings in laurel, Delaware. From the air, you can see the damage. Torrential storms threatening to delay the start of the Boston marathon. Runners forced to huddle in shelters. This after 30 tornados tore through seven states. There it is. It's hitting Shelby right now. Reporter: This twister leaving a 17-mile path of destruction through Shelby, Ohio, Sunday. Six people were hurt. Hurry, her hurry, it's coming this way. Reporter: In alto, Texas, Sunday, an ef-2 followed by an ef-3 an hour apart, leveling the town. There were three people here when this happened. They managed to escape unhurt by climbing out the front door there and they are lucky to be alive. We are still getting reports of tornadoes on the ground. Reporter: The town of Franklin, Texas, taking a direct hit from an ef-3 tornado with a 140-mile-an-hour winds. I've seen tornadoes but nothing like this. Reporter: And tragedy in Angelina county, Texas. 3-year-old Jace creel and his brother dilynn were killed after a tree crushed the car they were in. Their parents survived. And David, back here in cherokee county, you can see they are in the process of trying to clean all of this up, but the break in the clouds will not last long. More severe weather is expected to hit this area on Wednesday. David? Marcus Moore tonight. Marcus, thank you.